As you can see from our galleries, porticos come in a variety of styles and materials. They can be one or more stories high and as narrow as a door or much wider, typically with multiple support columns. Basic portico styles include flat, gabled, curved or hip. Hip roofs are quite popular with Georgia Front Porch customers and are a great option for bungalows, ranch-style homes and cottages. They have a gentle slope and a pyramid-like shape. Some hip roof designs feature flared corners that can give a home unique curb appeal and add more style to an ordinary façade. This style of portico enjoys a variety of benefits that help protect a home from inclement weather. A hip roof portico creates a uniformed look that, like gabled roofs, can direct rainwater and help preserve the building. In windy environments, hip roofs are particularly effective due to their aerodynamic design. Vaulted or straight hip roofs can feature asphalt shingles or metal materials. A curved hip roof portico design goes well with homes that have a bay window and/or hip roof over the home. This portico may employ a flat bead board which is one of our most popular ceiling styles. Or, you might choose a tongue and groove design for a classic, polished look. Layered trim is often used, such as two boards with a dentil fascia, giving a hip roof portico added dimension. And what about setting your new hip roof portico off with other clever design choices? For example, outdoor wall sconces are a favorite lighting choice for this style of portico. You may be inspired to replace your old doormat with a fresher style and texture. You may even add potted plants or new door wreath to create additional curb appeal and tie in color from your home or other plantings. Here are a few other things to consider when considering a new portico. An existing stoop footprint is commonly used to base the roof size. A typical stoop measures 5 feet by 8 feet which is 40 square feet. Some people prefer to increase the size by replacing or enlarging their existing stoop. 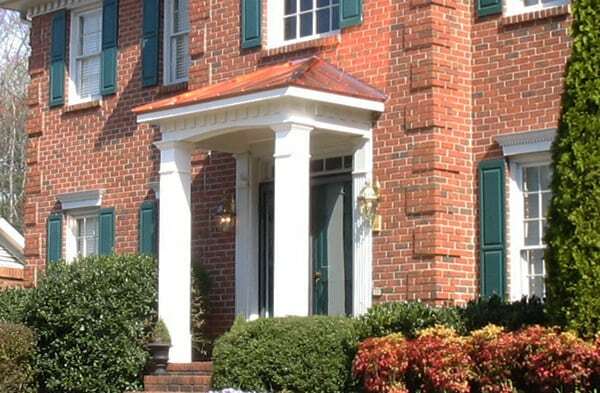 A larger portico adds more protection and a more dramatic look and opens you up to even more design styles like multiple columns, stone bases and even rounded porticos like those seen at historic homes including our nation’s White House. Some porticos are large enough to fit a car under so you or your guests can get to the door in rain or snow without getting wet. These are also known in the French term as a porte cochère. If you like the style of hip roof portico, give the curb appeal experts at Georgia Front Porch a call today at 770-781-8234. We will come to your home for a free and no-hassle design consultation to help you determine how a hip roof portico or other portico design would complement your home and add more value at resale. You’ll be amazed at the beautiful change that occurs when you add a hip roof portico to your residence.